Nearly opaque violet color. Aromas and flavors of vanilla toffee and berry pie crust with a silky, bright, dryish medium body and a sleek, breezy finish with notes of cashews, spiced berries, cedar, and brewer’s yeast with light oak flavor. A nice, easy-drinking zin sipper. Bottom Line: A nice, easy-drinking zin sipper. Zinfandel first came to American shores by way of the Schonbrunn collection which contained all the wine varietals grown in the Austrian empire. The earliest mention of Zinfandel, by name, in America was a vine nursery in Long Island in the 1820s. It made its way to California in the gold rush and thrived because of its hearty constitution and vigorous yields. Many a prospector had a little vineyard of Zinfandel and washed away their sorrows in their purple cups. Zinfandel is California’s pride and joy, a zesty, spicy, alcoholic (often 15% or more) wine that fits in well with the frontier spirit of the Golden State. The grape is believed to be related to one or more varieties in Croatia, while in the southern Italian region of Puglia, Zinfandel is a name sometimes given to the Primitivo grape. While there are excellent plantings of Zinfandel in may California regions, the districts of Lodi and Contra Costa County are very famous for this grape, especially as there are numerous “old vine” plantings that are often more than one hundred years of age. These vines produce tiny quantities, but the resulting wines are intensely spicy and brambly. Zinfandel has a good deal of natural tannin, so these wines can age well, as long as the winemaker can find the proper balance, not always an easy thing. Zinfandels from Ridge Vineyards, a celebrated producer in Santa Cruz County, are among the longest-lived and most refined examples. Recommended foods for Zinfandel are grilled or barbecued meats, wild game and stews – the heartier, the better. White Zinfandel, not to be confused with Zinfandel (red) is a blush wine, generally lighter-bodied with moderate sweetness. For a hundred years, zinfandel was the king of California reds. In 1884 it accounted for 40 percent of all the state's grape vines, but the grand old vineyards fell victim to modern economics and changing trends. Luckily, a small band of dedicated producers, coupled with a near-fanatical cult following, have continued to hold out. Against all odds, the pendulum just might be poised to swing back. So just what is it about these old vineyards that is helping to put zinfandel back on the map? The consensus seems to be that a vineyard reaches a qualitative peak between 25 and 50 years old. Because of prohibition, there are relatively few old vineyards in California. Of the state's 350,000 acres of vinifera, fewer than three percent are over 50 years old. The vast majority of these are devoted to zinfandel. While the percentage of cabernet vineyards exceeding even 25 years of age is minute, it is quite possible to sample the fruits of a fully mature zinfandel vineyard, often at half the price. In addition, old vineyards inherently produce less fruit. This factor provides a natural limit on the vine's tendency to overproduce. 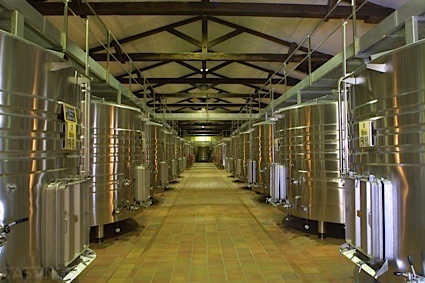 Though a problem if quantity is the ultimate goal, it is an essential factor in the production of high-quality wines. With the price of cabernet rising so precipitously in the last few years, it has once again become economical for vintners to produce wine from shy-yielding old zinfandel vineyards; winemakers are scouring the state looking for the odd parcel of vines. Also, vintners have learned how well some of the old methods of pruning and farming have worked, and are seeking to apply these principles in new plantings. Paul Draper, winemaker and CEO of Ridge Vineyards, summed up zinfandel's appeal best: "Zinfandel has so much forward fruit that it's sensual to drink right away. Its appeal is immediate, whereas cabernet needs time to develop. You can have a very sensual experience with cabernet, but you can have a comparable experience with young zinfandel--which is why, in a restaurant, I'd be more likely to order a zinfandel than a cabernet." 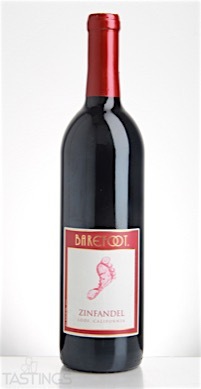 Barefoot NV Zinfandel, Lodi rating was calculated by tastings.com to be 86 points out of 100 on 9/28/2016. Please note that MSRP may have changed since the date of our review.